Join us for a weekend of enlivening sanga, kirtan and katha with HH Radhanath Swami and HH Devamrita Swami. These two esteemed speakers will unfold and reveal the beautiful pastimes of Lord Caitanya and His intimate associates. Emulating the mood and flavor of the world famous Pune Yatra held yearly in India, there will be nonstop, free-flowing mellows of sweet, humble offerings of the heart during this weekend of joyful personal transformation. The retreat will be nestled in the charming forests of Gita Nagari Dhama in the intimate association of Their Divine Lordships Sri Sri Radha Damodara and Their servants. The retreat begins at 1:00pm on Friday June 29th and ends at 3:00 pm on Sunday July 1st. More details of the schedule coming soon. Please click HERE (will open another page) to proceed with the retreat registration. Payment can be made using your credit card or via check at the venue. Please register and book your accommodation. Group Discount Code: GNJUNE29 - BOOKED OUT!!! Group Discount Code: GN June29 - BOOKED OUT!!! 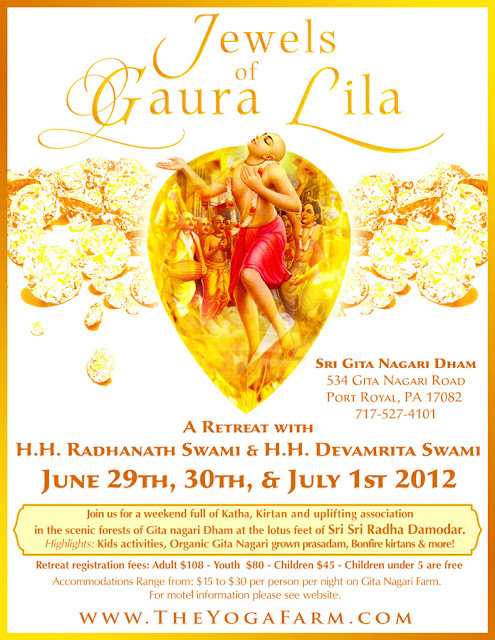 Group discount code: Gita Nagari Retreat - BOOKED OUT!! !